Adopting a pig is a potentially life changing decision. Make sure you are prepared for the adoption and by asking the owner or rescue plenty of questions. 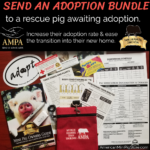 Gathering as much information about the adoption procedures and the adoptable pig will help you to prepare your family and home for the pig. If the pig is not a good match for your family then keep looking! There are plenty of adoptable pigs. It is only a matter of time until your perfect pig falls into your lap. Never rush an adoption decision, because adoption is for life. Am I allowed to meet the pig before applying for adoption? Are there any other families currently interested in adopting the pig I have chosen? Has the pig been dewormed? What vaccines has the pig had? Will I get the pig’s veterinary records with adoption? What is the pig’s history? What type of environment was the pig rescued from? What was the pig’s health at the time of rescue? What is the pig’s temperament? Has the pig shown aggression towards anyone? Has the pig bit anyone? Under what circumstances? How well has the pig adjusted to the rescue or foster home? How does the pig act around children? Strangers? Dogs? Cats? Men? What does your adoption contract require? Do you have a take back policy to take the pig back at any time if the adoption doesn’t work out? Under what situation would you press to remove the pig from my care? Did the pig undergo an initial quarantine upon arriving at your rescue? Does the pig have any special behavior needs? Does the pig have any special dietary needs? Does the pig need to lose or gain weight? What diet has the pig been on while at the rescue or foster care? Does the pig take treats gently? Is the pig more social or independent? Is the pig more affectionate or aloof? Is the pig trusting or timid? Is this pig more dominant or submissive with other pigs? Is this pig more dominant or easy going with people? If applicable, do you think this pig is a good match for the pig I have at home? If applicable, do you think this pig is a good match for the pets I have at home? Is the pig used to riding in vehicles? What do I need to transport this pig home? Does the pig come with any items? Harness, leash, crate, familiar blankets? Is my level of experience a good match for this pig? Is my home and family a good environment or match for this pig? What is the most challenging aspect of this pig? What is the most lovable aspect of this pig? Please explain to me your version of the ideal family/home for this pig.